Tired of the same of chicken dish for dinner? Then give this casserole a try. A savory one dish meal made up of sautéed vegetables, spaghetti and chicken. While baked in a creamy cheese sauce. Talk about rib-sticking, heart and soul comfort food to the max. YUM-O! 2. Cook 1 cut up chicken fryer. Pick out meat to make two cups. Chop and set aside. 3. Cook spaghetti in same chicken broth. Cook pasta according to package directions, but only cook it until it’s al dente (you still want a little bite to it). Drain the pasta and set it aside. 4. Melt butter in a large, deep skillet over medium heat. Add onion, celery and bell peppers. Cook until the vegetables have softened, about 4 to 5 minutes. In a medium bowl, mix together milk and soup until smooth. Add this mixture to the vegetables in the pan. Stir in mushrooms and 2 cups of shredded cheddar cheese. Continue to heat the mixture until the cheese has melted and the sauce is smooth. Add in cooked chicken, pasta and season to taste with salt, pepper, garlic powder and onion powder. 5. Pour the mixture into the prepared casserole dish. Sprinkle remaining cheddar cheese on top. 6. Bake for 35 minutes, or until the casserole is hot and bubbly and golden brown. Serve & Enjoy! 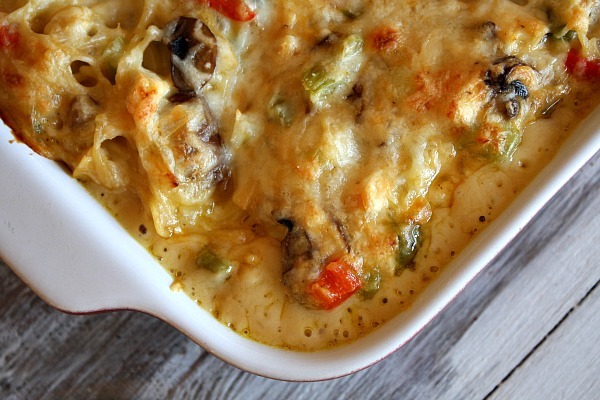 *CHEF’S TIP – Turn this casserole into a day-after-Thanksgiving meal by adding leftover turkey instead of chicken. Posted on August 8, 2012, in Lady Fab Cooks and tagged bell peppers, casserole, cheddar cheese, chicken, cream of chicken soup, cream of mushroom soup, dinner, food, mushrooms, Pollo Vegetarian, recipe, sphagetti, the porter house grille. Bookmark the permalink. 3 Comments. Four cups of cheese and two cans of canned soup make for a sodium overload!